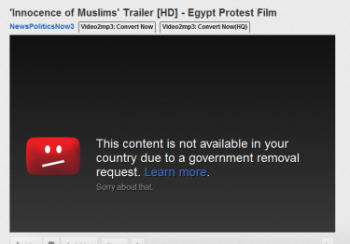 The government would see YouTube blocked for 30 days over The Innocence of Muslims. When inflammatory anti-Islamic video The Innocence of Muslims first appeared on YouTube last fall it sparked widespread protest, some of it violent, across the Muslim world. Egypt, like many of its neighbors, quickly blocked access to the clip. Now, almost 6 months on, the Egyptian government remains displeased with YouTube for still hosting the banned video, and would like to let YouTube and its owners know this by shutting the whole site down for 30 days. However, the government is being blocked from doing just that by the country's own telecoms ministry. Citing technical costs and legal concerns as reasons for its rejection of the shutdown, the telecoms ministry is appealing the judgement that called last week for the 30 day ban. It isn't alone, either; campaigning by its side is the Association for Freedom of Thought and Expression in Egypt (AFTEE to its friends), which described the proposed ban as "collective punishment of all YouTube and Google service users." In a statement, AFTEE added that, in its view, "Banning these websites will deprive internet users from the right of expressing themselves on those sites as well as depriving them of an important means of expression." Google, which owns YouTube, is used to this by now. Ever since it first appeared on the site, The Innocence of Muslims has prompted removal requests from governments all over the world, including a request from the White House. In a statement on the subject given to the BBC, Google said that it's been dealing with these requests carefully. "[We] work hard to create a community everyone can enjoy and which also enables people to express different opinions," said a spokesperson. "This can be a challenge because what's OK in one country may be offensive or illegal elsewhere." "The authorities in Egypt have notified us of individual videos that they believe are illegal and, after a thorough review, we have blocked access to them on the Egyptian version of YouTube," concludes the statement. At the moment Egypt is in flux, with widespread dissatisfaction with the behavior of its administration sparking riots across the country earlier this year. That a judge from the current administration, presided over by the Muslim Brotherhood, should call for a blanket YouTube ban because of The Innocence of Muslims is not surprising; that its own telecoms ministry should appeal it, however, is encouraging. Many will remember how the toppled government of dictator Hosni Mubarak attempted to use internet blackouts to control the population during the revolution, and to see parts of the post-Spring government working to ensure the right of Egyptians to access YouTube and use it as a forum for dialogue and the sharing of ideas (and, well, also things like that one He-Man music video that everyone always ends up at), is pleasing news indeed for fans of internet freedom everywhere. We'll keep you updated as this story progresses.